Today’s “Teach Out!” consists of a visit to the Fisherman’s Terminal to hear the rich stories of some of the last family fisherman left in Seattle, and then a bike ride to the newly burgeoning farm at the UW where we will be making pizza in a cob oven. The event is bike accessible, and is lead by a CAGJ member, Jason, who is confident to connect the bike crew from site to site. The bikers meet at the locks in Ballard, the point in which boats are transferred from salt water to freshwater and vice versa. It was built in the 1930’s, with an environmental awareness of fish’s migratory patters. Adjacent to the locks is the “fish ladder”, allowing fish to safely pass through the locks without being obstructed, somewhat like an artificial waterfall or rapid. From there, the bikers (about 7 of us) biked to the Fisherman’s Terminal to meet up at the first site of the trip. A woman introduced herself as Robin, and explained that she was working for the elections for Seattle’s Port Commissioner. She described in depth the politics of the port as a vital source of Seattle’s history and income as a city. Fisherman’s Terminal had been abundant with small fisherman and families throughout much of the Cities’ history. The larger industrial fisheries and city had been slowly displacing the smaller fisher folk for the last decade making it increasingly impossible for family fisher folk to make a livelihood on the port. 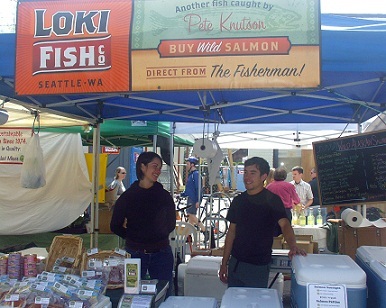 Hing, who is the joint owner of Loki Fish Company, introduces her family fishing business as one of the last family fishing productions left in Seattle. She describes the history of her family fishing business, and the roles that each of her family members plays in the business. One of her sons works accounting, the other works at the farmer’s markets, and her and her husband jointly operate the fishing boat. Hing’s father had been a fisherman, and while she continues in the tradition of his work, their fishing practices have been modified and adjusted to integrate more environmentally sustainable practices into their operation. She described the process of learning to fish with a flat net that sits perpendicular in the water, instead of the more obtrusive and destructive nets that compress all of the fish and bycatch together in one big tie. The former way (which they currently use) is more sustainable because there is far less bycatch, as they can target a certain size of fish that get their gills stuck in the nets and cannot free themselves. The other fishing companies use far more destructive practices such as bottom draggers that destroy all of the sea floor life. The port has slowly been making it increasingly difficult for these smaller fisheries to make a livelihood. Some of the ways in which this has been occurring is through hiking up the rent on the fish lockers, and making it illegal to sell from a tent in the rainy season to attract customers who have traditionally purchased their fish directly from the fisherman’s terminal. Also, the fisherfront restaurant that had gone up very close to the fisherman’s terminal made it illegal for the fisherman to sell any prepared fish such as smoked or canned. This passed easily through the port in support of the restaurant. In addition, the port is attempting to make the smaller fishing companies pay an additional daily fee of $25. Although this is a minimal fee, it is yet another strategy to put pressure on already an already fragile fishing economy. Overall, Hing seems to be quite sad about fate of the family fishing businesses that have already been displaced through external pressures. Their business seems to be doing quite well despite pressures from the port commission. It seems as through part of their success is through accessing a lucrative niche in Seattle farmer’s markets system. The bulk of their income now comes from the various farmers markets in Seattle, where they can sell directly to consumers. Those who purchase from Loki are aware of their practices, and support them intentionally with an awareness of their story. Farmer’s market sales have replaced direct selling from the terminal. I believe she said about 25 percent of their income comes from the farmer’s markets now. In reflection of Hing’s stories, it is obvious that the same pattern of displacement within agriculture that has happened to agrarian agriculture across the world is also very present with family fisherman. It appears to be the very same process and same pattern; a mixture of direct political negligence coupled with corporate pressures, and a kind of invisibility that hides their struggles to the world. The few that are still surviving find their niche in farmer’s markets and must adapt to appeal to a certain audience. As the biker posse continued to our next location, the University district farmers market, I think more about Hing’s family, and wondered more about their business. A constant struggle in my mind about the ethics of fishing cannot be outside of my reflection. The oceans are overfished nearly to the point of no return. Can their really be a sustainable fishing business given the extent of destruction of the oceans? Again, the quandary between environmental and social impacts. Can nearly 7 billion people be consuming sustainably harvested fish? Although I understand that the first battle to be addressed is the highly destructive commercial trollers, I still cannot consume fish without embodying the guilt of overfishing, no matter how “sustainable” it is. It takes about 20 minutes for us to bike to the farmer’s market in the U district. 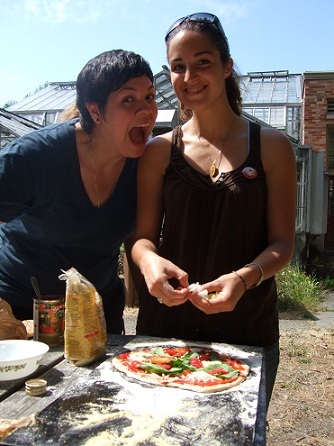 Our intention at the farmer’s markets is to not only explore the different farm stands, but also to buy toppings for the pizza that we are to be making later at the cob oven. We have 20 minutes to make the tour and select toppings. I meander to the Loki fish stand and chat with the folks there for a bit. I have not purchased fish ever in my life, but I feel motivated to buy some for the sake of Hing, for her story. The farm on the UW campus seems to be a relatively new endeavor. The oven had been built by students, and volunteers, who decided without asking the University that a cob oven should be built to serve as a communal resource. Our group meets up at the cob oven which was adjacent to a long row of greenhouses. There is already a small group stretching dough and putting toppings on the pizza. All of the toppings that we purchased at the farmer’s market are put on the table. Spinach, garlic, fresh herbs from the UW garden, basil. The cob oven is very interesting. A fire had been started a few hours before we arrived to get the heat up for making pizza. The pizza’s are quickly slid into the oven, watched eagerly for a minute or so, and then taken out. A UW student gave us a tour of the farm. We weave through the greenhouses and through the raised beds growing with potatoes, kale, herbs, and onions. She says that many projects are still at the experimental level, such as the quinoa in barrels and the potatoes growing in vertical containers in straw. She is quite optimistic, lively, and excited about all of the cool things growing. We convened again at the cob oven, pitch in 5 dollars for the dough that Teresa, Andrea, and Molly had made, and the discussion was brought back to a “call to action”. Jason, (who had guided the bike tour) rearticulated the discussion that was had earlier regarding the port politics and the displacement of family fisherman. He and Teresa had written up a letters that explained the importance of the port preservation for small fisherman, and urgent call to keep that vital resource available for the city. The letters are to be sent to the port commission. There is ample room for each of us to write in a personal statement about or thoughts on the issue, putting a voice to our action, and calling for more socially just approach to managing our waters. 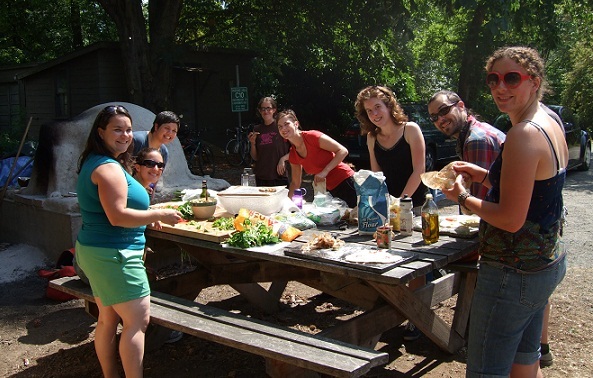 Posted in Food Justice Blog Posts, Uncategorized and tagged farmer's market, fisherfolk, Teach-Out.